Good morning! We're all nursing colds this weekend, so this post is going to short and sweet. 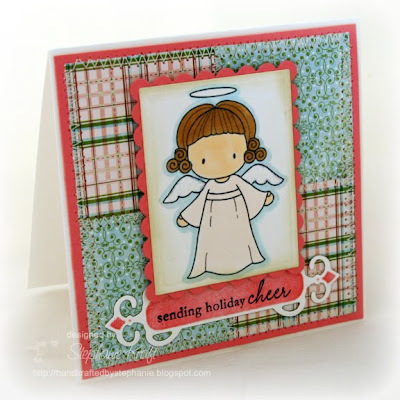 I was feeling a little better, so I decided to play along with Sparkle's Christmas Card Challenge Week #48. The challenge this week is to use multiple squares on your card. I started using Beate's Weekend Sketch #103, then I altered slightly to look more like a quilt. My image is another of the digi Sugarplums Angel Emmas. I hope you have a great Sunday! Thanks so much for stopping by! Accessories: Rectangle, Scalloped Rectangle Nestabilities, and Fancy Tags (Spellbinders), Markers (Copic), Star Dust Stickles (Ranger), Foam tape, Thread, Sewing machine. Your card is just darling! I'm glad you're starting to feel better. So sweet! Love that quilted look!